Used Log Mark form as the form for the Cattle Brand. Geo J Ouillette Dep Co Clerk. 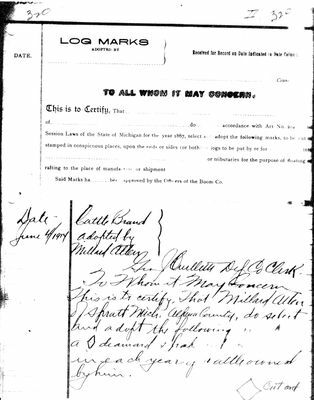 This is to certify, That Millard Allen of Spratt Mich, Alpena County, do select and adopt the following mark of [mark] diamond shape and [?] in each year of cattle owned by him.